The highlight of the past month was the turf cutting of the Deanery CE Academy secondary school. 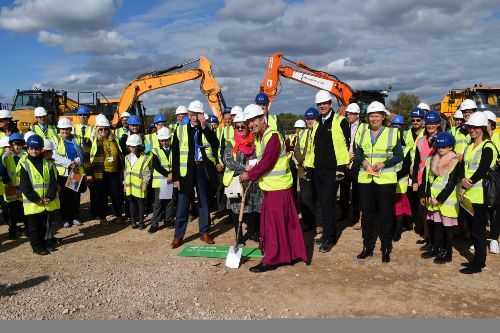 We were lucky with the weather and it was great to mark the official start of works with all those who have been working on the school, as well as children and headteachers from primary schools across Swindon. The Bishop of Swindon did the honours in terms of the actual turf cutting although given the ground was pretty hard this was quite a challenge. It was concluded that the school was built on ‘solid ground’. Good progress is being made on the school construction with the current focus on ground improvements, drainage and foundations. Work has also started on the second construction site with diggers moving onto the area around the canal north of Waitrose. This section of canal is on the original route but was dug out some time ago to create what was effectively a fishing lake and is not therefore up to the standard required for a canal. We were particularly concerned about the canal banks in this area and took the decision to fully drain the canal so that we could inspect the bed and banks properly. We also took the opportunity to install some drainage related to the future housing parcels. 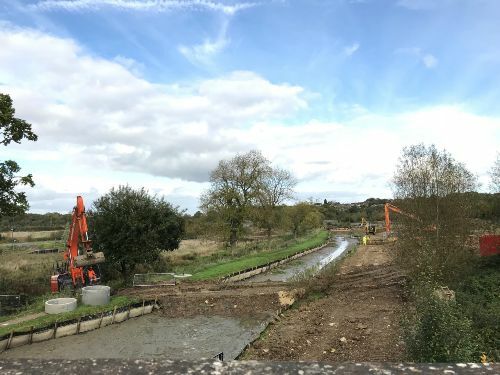 The canal will be widened slightly and a new ecological edge created to provide a home for the water voles who will hopefully recolonise this section.The water has been pumped to both the north and the south so that we can fill the section back up once the works are done. All the fish (including one rather large one) were caught under ecological supervision and moved into the adjoining sections. We also took on feedback from the Wilts and Berks Canal Trust and are putting in a few sections of more solid edging just to the north of the bridge to help with the future operation of boats. Unfortunately the works have meant that the Dragonfly won’t be able to get to its landing stage outside Waitrose for a while but hopefully the short term pain will be more than outweighed by the long term improvements. We have made a couple of other planning applications this month including an application for new site signage and an ecological area to the south west of the site. As we clear new areas of the site for construction, we need to create some enhanced areas of habitat where we can place the Great Crested Newts that we find. 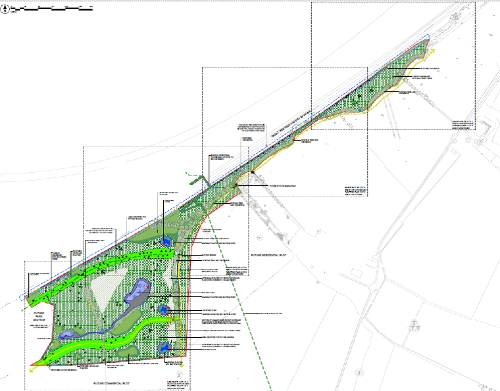 New ponds, trees and landscaping will be introduced and we will also be marking out the areas where the future footpaths will be constructed. There will be work starting on laying an electricity cable along Peglars Way in the next month which will require some short sections of traffic lights so watch out for this if you are driving through the site.